Rick Kelly has scored a fifth place finish for Jack Daniel’s Racing in the opening race of the Albert Park 400 at the Formula 1 QANTAS Australian Grand Prix in Melbourne, Victoria today. Kelly qualified in ninth for today’s 25-lap race after a disappointing showing in this afternoon’s Top 10 Shootout. 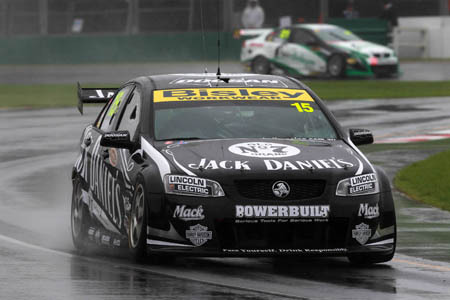 But he turned things around in the race, making two spots off the line aboard his #15 Jack Daniel’s Commodore and holding ground despite using the harder compound Dunlop tyre in the first stint of the race. After pitting for soft tyres, Kelly was able to race up through the order. Despite a spirited effort over the last four laps he was unable to pass Alex Davison, leaving him to finish in fifth place. Following qualifying and the first of three races this weekend, Kelly is in third place overall on points behind Shane Van Gisbergen and today’s race winner Jamie Whincup. Todd Kelly again had a day to forget, crashed out of the opening race on the second lap today. After the windscreen of his #7 Jack Daniel’s Commodore was covered with oil, Todd Kelly’s vision was heavily compromised and as he tried to bring his car to pit lane to have it cleaned he was hit from behind by James Moffat and sent into the Turn 5 tyre wall. Todd Kelly soldiered on to finish one lap down in 25th place and now turns his attention to the two remaining 25 lap races on Saturday and Sunday. “It was a really enjoyable race and an improvement on our qualifying position,” said Rick Kelly. “We got a couple of positions off the line at the start and we had really good pace on the hard tyres. “When we came out of the pits on soft tyres I got held up and we were not able to pass. I was blocked on every corner by Davo (Alex Davison), I don’t know how he didn’t get a black flag. “But that’s the way it is. It’s the GP so I’m not going to be too rude and slam into his door trying to pass when he is blocking like that. “It’s been one of those weekend so far for me,” said Todd Kelly. “A lot of the guys in front bunched up and I happened to be in the right spot at the right time and made up a lot of spots. “On the second lap there was a car that was spraying oil everywhere and I copped it. “From half way around on the second lap I couldn’t see through the windscreen, so I tried to get out of the way but got sent into the fence and it bent the steering. Both David Reynolds and Greg Murphy have scored top 15 finishes in the opening race of the Albert Park 400 at the Formula 1 QANTAS Australian Grand Prix in Melbourne, Victoria today. David Reynolds finished in 12th spot aboard the #16 Stratco Commodore, unlucky not to score a top 10 finish after losing several spots in pit lane after encountering heavy traffic at his pit stop mid-race. 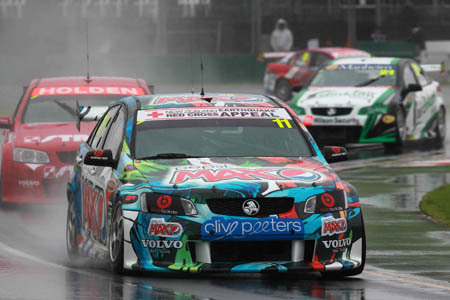 Greg Murphy made ground during the opening stint, using soft Dunlop tyres on his #11 Pepsi Max Commodore, but once switching to the harder compound tyres he dropped to 15th place. Both drivers will look to make ground in the two remaining 25 lap races on Saturday and Sunday. Jamie Whincup won today’s race from Garth Tander, Shane Van Gisbergen, Alex Davison and Rick Kelly. “Today was OK for us,” said David Reynolds. “But it’s a bit dark out there at the end … it was hard to see anything! “It was a good race for the Stratco Commodore. We went forward and to make it to 12th was decent. “We should have made a few more spots but we lost time in the pits. Everyone pitted when I did and there was a lot of pit lane congestion. “We were not able to be fast enough to make the most of each tyre,” said Greg Murphy. “We didn’t go far enough on the soft tyres when we started on them and then we were just not ‘pacey’ enough for long enough to get the gain we needed for when we went to hard tyres. “That cost us three or four spots and we probably should have been around 10th place if we had been able to be faster on the soft tyre.